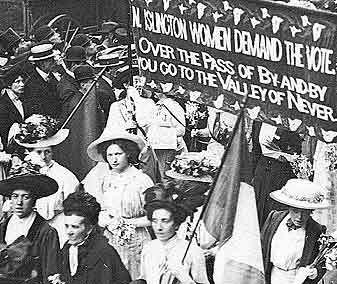 Although British women and men had been arguing for both universal and women’s suffrage since the 1860s, the movement for women’s votes accelerated when Emmeline Pankhurst and her daughters Christabel and Sylvia founded the Women’s Social and Political Union (WSPU) in 1903 – a more radical organization than some of the earlier ones fighting for suffrage. Its slogan was "Deeds Not Words" and in fact the WSPU became more and more militant as the years went on and the British government refused to support women’s suffrage. In 1906 a Liberal government was elected to Parliament for the first time, with first Henry Campbell-Bannerman and then, in 1908, Herbert Henry Asquith as Prime Minister. Suffragettes were very hopeful that the Liberals would support them as promised in many candidates’ election campaigns. But they were to be disappointed, particularly with Asquith, a noted anti-suffragist. 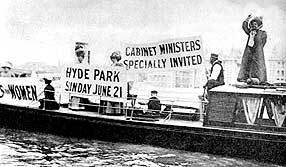 Even the Women’s Sunday march in Hyde Park in June 1908, in which 250,000 people shouted "Votes for Women," did not move Asquith to allow a suffrage bill to be introduced. As suffragettes became more militant, their actions and their treatment by the police became more violent. What began as women chaining themselves to railings outside the Prime Minister’s residence accelerated into window smashing, and then descended into states of riot at demonstrations – often orchestrated by police. Inevitably suffragettes were arrested for public disorder and give prison sentences of anywhere from 3 days to several months. The most notorious prison was Holloway in north London. On 18 November 1910 a protest in Parliament Square turned violent and police beat many suffragettes. After that the movement began to wage guerrilla warfare, orchestrating systematic window-smashing and arson attacks. As it became more radical and violent, the WSPU lost many of its supporters. In June 1913 Emily Wilding Davison threw herself under the King’s horse at the Derby racecourse and was killed. She was the only suffragette to die for the cause and was made into a martyr. In August 1914 war was declared in Europe. The suffrage movement suspended its activities, the government released all suffragettes from prison, and the Pankhursts and others threw themselves into supporting Britain’s war effort. Around a million women took on men’s jobs as they went off to fight in the war. In February 1918, the Government passed an act giving women the vote if they were over the age of 30 and either owned property or rented for at least £5/year, or were the wife of someone who did. As a result, 8.5 million women became entitled to vote in the General Election of 1918. On 2 July 1928, a law was passed allowing all women over the age of 21 to vote. It is debatable how much effect the suffragette movement had on bringing about changes in voting laws. Some believe the movement’s militancy made the Government more intransigent. Others say the 1918 Act was passed as a reward for women’s efforts during the war rather than anything the suffragettes did. There is no doubt, however, that the suffragettes raised the profile of the issue of women’s votes to that of national consideration.